See complete article from the MASE website here. Ma’an, Jordan – May 2017: MASE is pleased to announce the official inauguration of its flagship solar PV facility — the Arabia One 11.5 MW Solar PV Plant — under the Royal patronage of His Majesty King Abdullah II bin Al Hussein. The grand ceremony, which was organized by the EDAMA Association, took place within the premises of the Ma’an Development Area (MDA) Solar Park I and comprised the official inauguration of the twelve Round I solar PV projects. Separate in-person briefings by each of the project developers were given to His Majesty during the 30-minute ceremony. The briefing provided by the Arabia One team focused on the constructive outcomes of the Arabia One development, including local job creation, skill development and most importantly the conception of bankable local project developers, asset managers and plant operators. The Arabia One team also elaborated on the continuing activities of Arabia One’s local developer ATC, the only developer to have been successful in both Round I and Round II of the direct proposal program and currently developing the Safawi 50 MW solar PV project in northern Jordan, expected to achieve commercial operation by mid-2018. 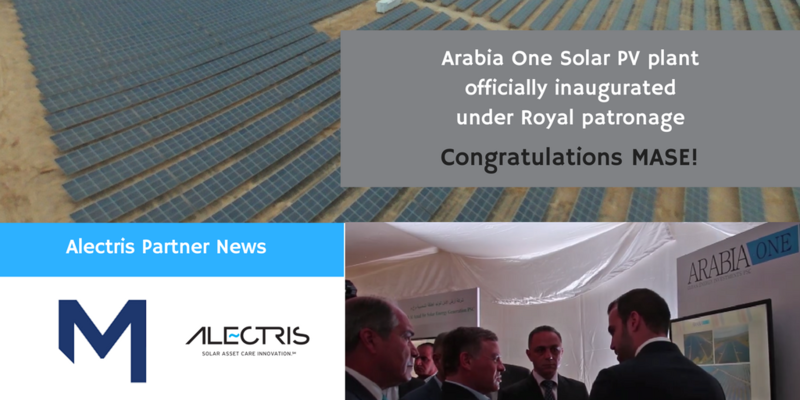 ASE, along with its O&M partner Alectris, is responsible for managing, operating and maintaining the Arabia One 11.52 MWp Solar PV Plant through a comprehensive and bankable O&M and Asset Management Contract. MASE has been approved as an O&M vendor by the Project’s sponsors, which include international solar companies and global investment firms, and its lenders, including the World Bank’s IFC and FinnFund. MASE currently carries out preventive, corrective and conditional maintenance activities on the Plant, as well as operations and asset management services comprising periodical reporting, real-time monitoring, forecasting and maintenance service management.